People in the Ballymurphy area of west Belfast expected British soldiers to protect them during a shooting incident in 1971, but instead hid fearing a massacre, an inquest has heard. Eilish Meehan said people had gone to an Army to “ask for protection”. “That never came, but we were shot at and nobody had a clue why,” she said. Another witness, Joe Millen, told the inquest he believed a bullet passed through him before striking Francis Quinn in the head. 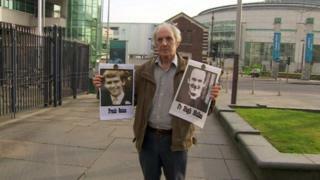 Ten people, including 19-year-old Mr Quinn, were shot over three days in August 1971. Both witnesses described seeing men and youths with guns in both the loyalist Springmartin and nationalist Moyard areas. However, no witness has come forward with evidence at the inquest to suggest that shooting came from the field where Fr Hugh Mullan and Mr Quinn died. Ms Meehan, who was then aged 19 and was helping evacuate children from the Springfield Park area, told the inquest that before the shooting started she had seen a number of boys throwing stones at soldiers based at the Henry Taggart barracks, but described that as not unusual. Later a crowd had gathered at the back of the houses in Springfield Park. Ms Meehan said someone shouted “they are coming in”, in reference to loyalists in Springmartin, and there was a single shotgun blast, which she described as a “warning shot”. She said she did not see who fired the shotgun in Springfield Park, but said she overheard someone say it was a legally held gun used for hunting. Ms Meehan described the main shooting event that evening as “crossfire” with shots coming from two directions, including from people lying on top of flats in Springmartin. She described a “sense of disbelief” when she heard that local priest, 38-year-old Fr Mullan, had been shot. “There was panic… you don’t shoot a priest, we thought we were going to be overrun, massacred,” she said. “I thought it was loyalists were firing on us. Giving evidence, Mr Millen said he heard Fr Mullan scream three times. He said he started to crawl towards him but heard a shot and realised he had been struck in the back. He asked a young man nearby for help but that man, later identified as Francis Quinn, had also been shot and was dead. Mr Millen believed that the bullet passed through him and struck Mr Quinn in the head.